EATING MY WAY AROUND AMERICA (Part 1) or How I gained 5kgs without really trying. From the moment I stepped off the plane in Louisville, KENTUCKY, I started to sneeze uncontrollably. Sneezes turned into the most appalling sinus/hay fever attack that lasted the 5 day duration of our stay. Sinus headaches, more sneezing, tickly throat, aches and pains, watery eyes – you name it. I got it. I felt wretched. His Nibs, who is a shocking sufferer of hay fever, didn’t get so much as a sympathetic sniffle. I used everything in the portable pharmacy he carries around with him when travelling overseas. Nothing worked. He suggested that I was allergic to a red state. My sister concurred, and suggested that this was why states such as Kentucky were flyover states. The only time I had any relief from this awful wretchedness was when we went to Churchill Downs Race Course (where they run the Kentucky Derby) to see the last group 1 of their racing season, and when visiting the various horse studs that dot this neck of the woods. I never knew that horses and horseshit were a cure for hay fever. It is so unlikely, therefore, that the winner for my favourite restaurant in the USA dwells in the centre of Louisville, KENTUCKY, and that it goes by the unexpected name of The ENGLISH GRILL. This restaurant is responsible for my eating, over two nights, perhaps one of the best meals I’ve ever eaten. Ever! Anywhere! The ENGLISH GRILL is the restaurant that is part of the BROWN HOTEL, a historic hotel in the main street of Louisville, KENTUCKY. For me to not only enjoy, but also absolutely rave about a restaurant while feeling like death warmed up is testimony as to just how good this restaurant is. I started with an entree of scallops in a saffron sauce: simple, piquant and delicious. However, it was my main meal, the piece de resistance, which had His Nibs and our friends, deciding to return the next night. My main course was a rib eye steak with porcini mushroom sauce and potatoes. A simple, elegant meal cooked to exquisite perfection. It was worth starting World War III over. The meat just melted in my mouth, and all I could say was YUM and grunt a lot. There was no room for dessert. The following night was a light night with smoked salmon and salad. Bliss. It had to be light so I could indulge in the dessert I was unable to indulge in the night before. The salmon was delicious, fresh and not oily. It was smoked with a wood I didn’t recognize but was tantalizing. However, it was my friends’ choice of a lobster mac, lobster macaroni, which was outstanding. The homemade pasta was al dente and coated by a delicious sauce with a heap of lobster bits. The pasta wasn’t drowned by the sauce, as is so often the case– in fact, it was bloody perfect. Then came the dessert. All four of us had the same dessert. It was a berry soufflé with a chocolate crème anglaise sauce. This light dessert had a balanced combination of rich, sweet and sour flavours, all popping off with each mouthful. HEAVEN! AMBROSIA! Food for the Gods! The Executive Chef came to visit our table having been told these noisy Australians were back for seconds. We gave him a loud round of applause. He’s French Canadian, Laurent Geroli, who is a brilliant chef. How he ended up in Louisville is beyond me, but the Brown Hotel gave a young man the Executive Chef’s hat. He fills it more than adequately. The sommelier, whose name I didn’t get, runs the restaurant, and is one of those really talented women who are awe inspiring in people oriented jobs. She is wonderful, has a great sense of humour, remembers your name after the first meeting, and really knows her wines. If I owned a restaurant in Sydney I would kidnap both of them. It is worth flying to Louisville to stay at the Brown and eat at the English Grill. While you are there you can visit the horse museum at Churchill Downs (and learn the story of SECRETARIAT, America’s PHAR LAP) and the Muhammad Ali museum. Both are worth visiting. 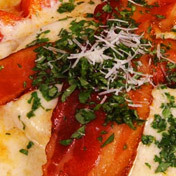 The Brown Hotel also has a historic signature dish called the Hot Brown. I warn you this is a dish not to be eaten in 90f heat which I made the mistake of doing. It is a ripper of a dish, especially as comfort food on a cold winter’s day. I include the Brown Hotel’s recipe for your enjoyment. You won’t need to eat for 24 hours afterwards. For “broiler” think “grill”. (J). 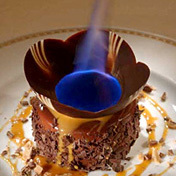 Posted in Food, Politics, Sport, Kitchen and tagged best restaurant in America, Churchill Downs, Laurent Geroli, Louisville Kentucky, The Brown Hotel, the English Grill, the Hot Brown recipe. Bookmark the permalink.